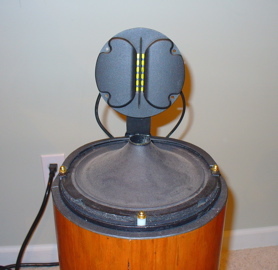 I’ve just finished assembling a pair of modified Decware Radial 1 speakers. Cutting to the chase these sound absolutely stunning and come close to trumping my Infinity P-FR’s in almost every way. As these original Radials came unassembled with upgraded speakers, Jensen capacitors, Audioquest Indigo internal wire, etc, I took the liberty of continuing the upgrade to 1.5’s by adding new bases, cones, passives etc. (thank you Zygi!). After fixing various issues with the veneer, I decided to turn my attention to seal the inside of the speakers with black hole pads that I obtained from speakercity a while back for a different project. (If anyone is curious, you can do both speakers, top and bottom gaskets, etc. in 6 sheets. – highly recommended). I sit here slack-jawed as I can’t believe the detail and range I’m hearing from these speakers. When I hear folks talk like this, I usually role my eyes and move on, but the imaging, depth and bass (yes, i said it… bass!) that is coming out of these speakers is absolutely astounding. I need to experiment a bit more with different resistors and weighting the passives, but I’m absolutely floored by what I’m hearing. I have a crummy room for audio, but these speakers seem incredibly forgiving of this sin. And when I open my eyes I absolutely amazed at how such small speakers can produce such a large, accurate soundstage.